(non) rules, have at 'er. This is supposed to be creative and fun! You've got all week to sew your skirt. 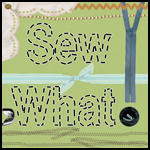 Once you're done, please add your creations to my Sewing Dork Flickr Showcase and show off your talent. Melissa and I will do the big reveal each Sunday, and throughout the month we'll be posting your work on our blogs. Week two's challenge will be announced next Sunday! Sheesh, go see Melissa for a button! oh fun! Last week I just recycled two pairs of jeans for a skirt and purse.